1.2 Why Use a Garden Cart? 2.1 What Types of Carts are Available? If you’re a green thumb and absolutely love your garden, then you are probably wanting to know what the best garden cart is. Or perhaps you live on a large property and have been considering for a while now that purchasing one of the garden carts for sale would really make your life so much easier. In this best garden wagon cart guide, I will give you some tips on how to purchase the best yard wagon for your personal circumstances as well as what you should look for in a garden cart. Lastly I will review some of the different yard carts for sale. Hopefully after reading this guide you will be able to choose the best choice garden cart for you and be that much closer to purchasing one so you can get back to working in your garden. Whether you are after the best lawn cart, the best wheelbarrow for sale, a folding garden cart or the best dump cart, hopefully you will find what you are looking for in this guide. If you prefer a wheelbarrow, I also have a guide to the best wheelbarrows. Don’t have time to read my entire review? My choice for the best garden cart is the Gorilla Cart Steel Garden Wagon with Removable Sides. See current prices and read reviews here. I just love this cart because it’s sturdy, adaptable, and gets the job done. It’s easy to keep clean and the pneumatic tires roll easily over my yard. It’s perfect for hauling compost to the garden bed, rocks for a DIY walkway, or even pulling the kids around. 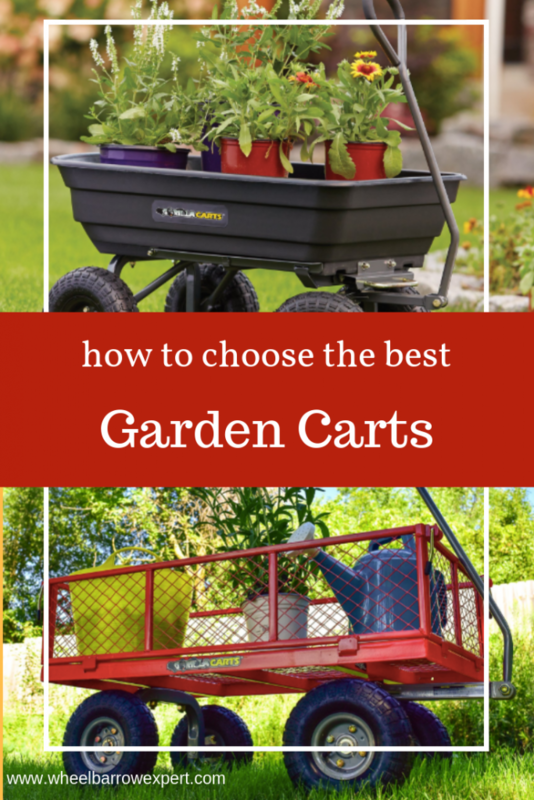 Read more about the best garden carts below. Why Use a Garden Cart? Perhaps you’re not convinced you need to purchase an outdoor garden cart and wondering if it is worth the investment. Having the best yard cart makes working in your yard so much more efficient and enjoyable. You can load up your garden tools and supplies then haul then to wherever you need to without going back and forth to the shed numerous times. The best utility cart is even more important if you live on a large property where it is a five minute walk to the back of the property or maybe even a tractor ride away. If the above rings true for you, then read on because perhaps it’s time you invested in a garden cart. Don’t have time to read the entire review on the best garden carts? See the table below for a quick comparison of the main features of the various carts that are in this guide. There are four main types of garden carts: a utility wagon, a flatbed garden cart, a garden dump cart and a folding garden wagon. Which one is right for you depends on your needs within the garden – more on that later, but for now let’s take a closer look at the different types of garden carts available. A garden utility cart can be a 2 wheel garden cart (a garden wheelbarrow) or a 4 wheel garden cart and typically has 4 vertical sides to keep its contents well contained. Usually on the 4 wheel wagon cart the sides are removable or at least able to be opened, which makes for easy access and cleaning. 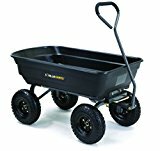 A utility wagon cart is perfect for hauling soil, compost, plants, fertilizer, cuttings and wood chips. Having an outdoor utility cart which allows for the sides to be removed or opened also lets you carry oversized or oddly shaped items, such as large bags of soil, large plants or pots. Like an outdoor utility wagon, a yard dump cart has the added advantage of being able to dump its load. This is great as you don’t have to manually shovel out things like soil or wood chips. 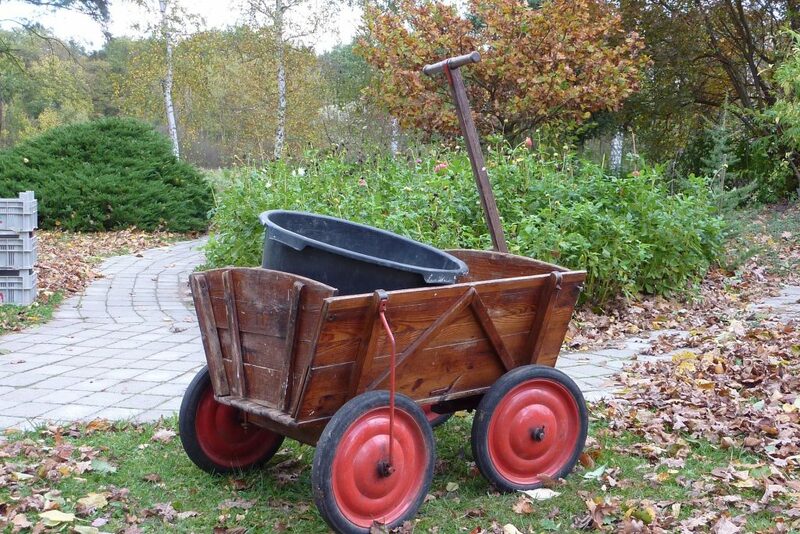 A garden dump wagon is perfect for hauling soil, compost, plants, fertilizer, cuttings and wood chips basically anything that you wish to transport and then dump. A flatbed garden cart doesn’t come with sides and is best for transporting large nonstandard objects. This type of outdoor cart is perfect for hauling large bulky items such as bags of soil, large plants and pots. If you want a multi purchase cart, purchase a utility cart that has removable sides so you can use it as either a flatbed cart or a utility cart. 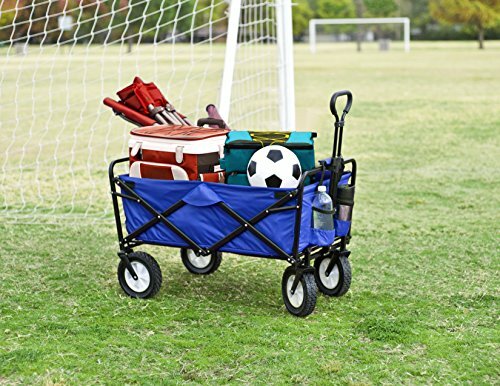 A folding yard cart has fabric sides with an accordion frame that allows you to fold up the cart when not in use. Usually the load capacity of a collapsible garden cart is much less than the other type of carts mentioned, however these are perfect for people with small gardens and limited storage space. These are also generally able to be used for other purposes such as carting various items to a picnic or beach. Garden wagons for sale come in many shapes and sizes and when purchasing the perfect cart for you, there are a few things you’ll need to consider. The first thing you need to consider is what is it you will be typically carting in your outdoor wagon. If you will just be transporting dirt, wood chips and plants for gardening, then you’ll want a landscape cart with high sides, preferably removable so you can easily clean it out. 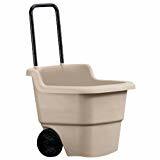 However, if you will be carrying larger plants or awkward shaped items then look for the utility wagons for sale with removable sides. So, you know what you will be most likely carting around, so next ask yourself what load capacity do you require and how far you will typically need to move them. 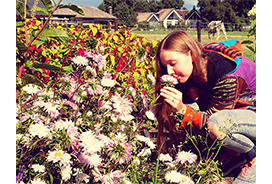 A lot of this will depend upon the size of your garden. Most likely the bigger your garden, the bigger load capacity you will require in your landscape wagon. Don’t buy a yard wagon for sale with a large load capacity just for the sake of it though, as there is a huge difference in price from a cart that is suitable to carry say 500 pounds or less as opposed to a cart with a capacity to carry say around 1000 pounds. 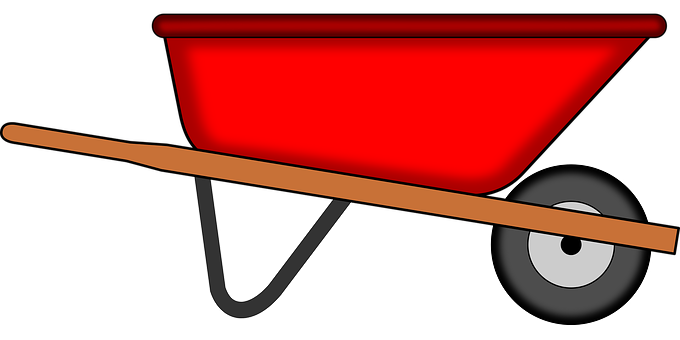 If you require your garden yard cart to carry more than 500 pounds, you are better off purchasing a heavy duty wagon cart. Heavy duty garden cart models have larger tires and are constructed from thicker materials making them much heavier and sturdier. How will you be Hauling it – Motor or Human Strength? If the items, you will be carting are particularly heavy or you will be using the yard utility cart on large properties then you may like to consider the wagon carts for sale that can be attached to a quad or tractor. 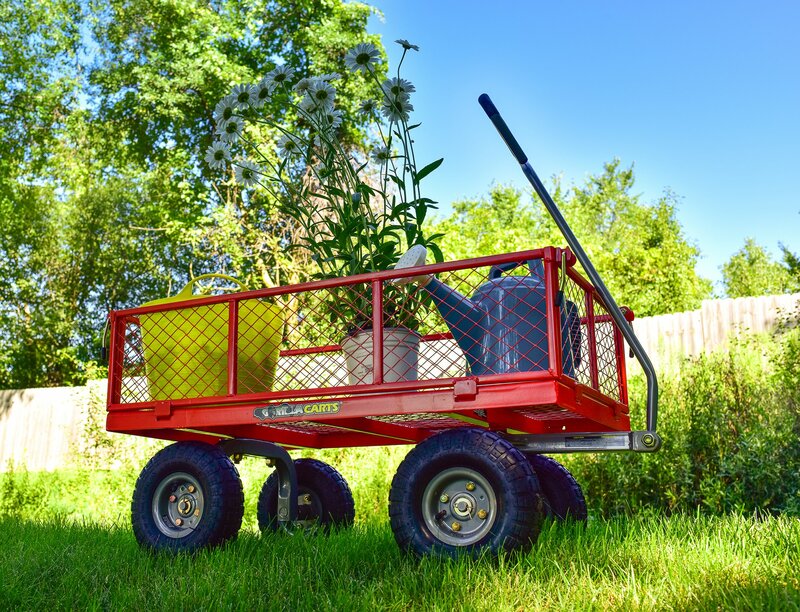 If you will be using your own muscle strength to haul the garden utility wagon, then consider the weight of the cart plus its items to ensure you purchase a cart that you can easily move about. Also keep in mind that a metal garden cart is much heavier than a plastic garden cart. Yard wagon carts come with a range of tire types. Some garden cart tires are plastic whilst some are rubber. Some have tread, whilst some don’t. There are pros and cons to all types of yard cart tires depending upon what you plan on hauling in your cart. 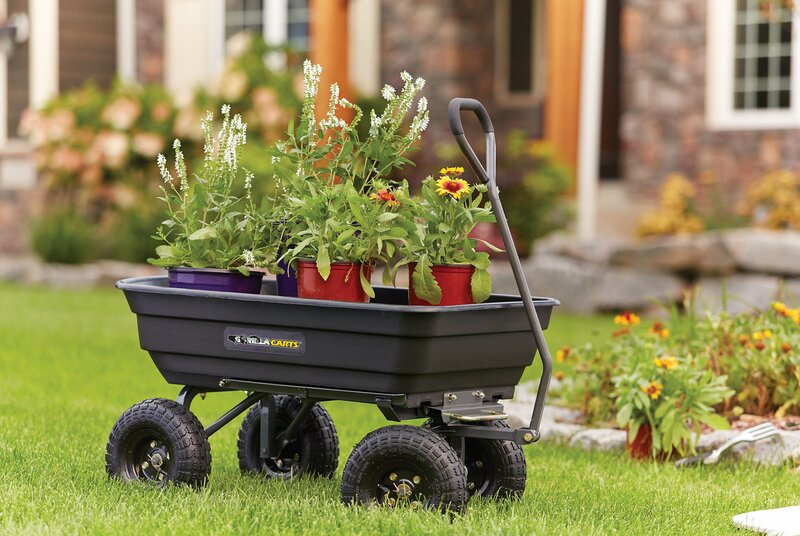 A small rolling garden cart with plastic tires is great for smaller loads where you will be carting it over soft surfaces such as grass with the added advantage that plastic tires don’t puncture. For larger loads and a large yard cart, particularly where you be hauling over rough terrain such as gravel, you will want to consider lawn and garden utility carts with pneumatic tires made from reinforced rubber. Usually garden carts are constructed from either plastic, polyethylene or steel. Out of the three, a steel garden cart is the most durable and better suited for heavier loads. 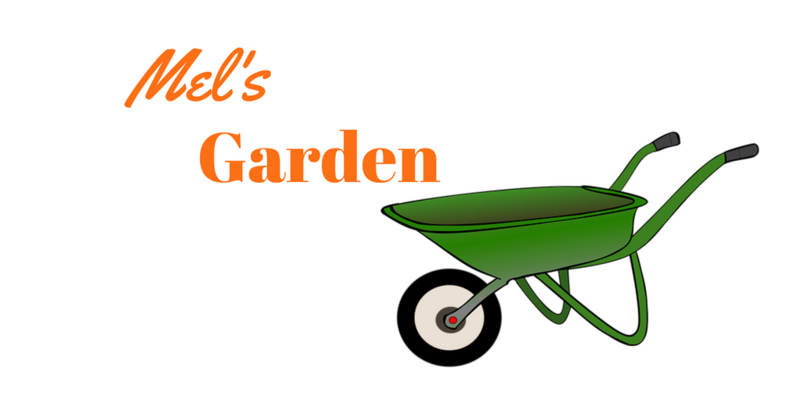 A steel garden wagon can withstand years of heavy use without being damaged. However, keep in mind carts constructed from steel are prone to rust and much heavier to haul. Another option is polyethylene carts. Whilst a poly garden cart weighs much less than a steel yard cart they are not as sturdy or hard wearing. However, a poly yard cart has the advantage of not rusting. The least hard wearing carts are constructed from plastic. However a plastic yard cart can still be ideal for smaller loads or for people that don’t intend to use their cart that regularly. A plastic garden wagon is inexpensive, lighter and easier to haul around but is likely to crack over time. For gardeners wanting an extra helping hand in the garden, this Gorilla cart is the perfect companion. This Gorilla wagon has a powdered coated mesh steel frame with removable sides, transforming the cart into a flatbed making it perfect for carrying larger and awkward sized loads. This particular Gorilla garden cart bed measures 34 inches by 18 inches and has a capacity to carry up to 400 lbs making it the perfect size for the everyday gardener wanting a garden trolley cart to make their gardening more efficient. The Gorilla yard cart is easy to assemble and maneuver with other great features including a padded pull handle, 10 inch pneumatic tires and it comes with a 1 year warranty. This small garden cart is the perfect companion for the everyday gardener or the home DIYer. If you like the look of the Gorilla 400 lbs cart but need a bigger load capacity, then maybe the Gorilla 800 lbs cart is for you. Just like the smaller 400 lbs cart, this Gorilla cart wagon has a powdered coated mesh steel frame with removeable sides, transforming the cart into a flatbed making it perfect for carrying larger and awkward sized loads. This particular Gorilla steel utility cart bed measures 38 inches by 21 inches and has a capacity to carry up to 800 lbs making it the perfect size for people with larger yards or spend a lot of time in their garden. Featuring a padded pull handle, 10 inch pneumatic tires, this Gorilla cart steel utility cart is easy to assemble and comes with a 1 year warranty. 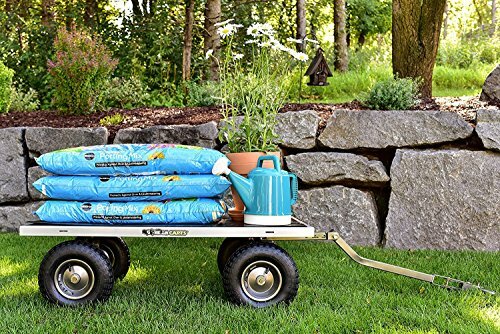 This is a durable heavy duty garden cart perfect for people looking to move larger items such as rocks and tree stumps as well as large loads of soil. If you need the maximum amount of space to haul large loads, then the Gorilla 1000 lbs cart is for you. Featuring a steel mesh frame, this Gorilla cart has a bed measuring 49 inches by 24.5 inches with removable sides transforming the cart into a flatbed making it perfect for carrying larger and awkward sized loads. Despite being quite large, with its padded handle this large garden wagon is easy to maneuver by hand or there is even the option of attaching it to the back of a tractor or quad for towing. Like all the Gorilla garden wagons in this review, this heavy duty garden wagon comes with a 1 year warranty and is quick and easy to assemble. This large garden cart is the perfect companion for the serious home gardener or for those living on large properties. The last of the Gorilla carts to be featured in these reviews is the Gorilla poly yard cart. This lawn and garden cart is in fact a garden dump cart featuring a quick release dump feature making it quick and easy to unload. 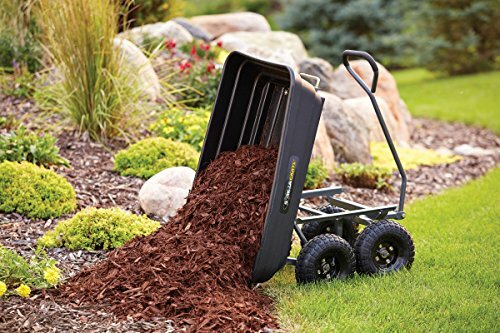 This Gorilla dump cart is a great alternative to a traditional heavy duty wheelbarrow and is super easy to maneuver. This Gorilla lawn cart has a poly bed which measures 36 inches by 20 inches and has a capacity to carry up to 600 lbs. Being constructed from poly, it’s easy to clean and you don’t need to worry about it rusting. Other features of this best garden dump cart include a padded pull handle, 10 inch pneumatic tires and it comes with a 1 year warranty. 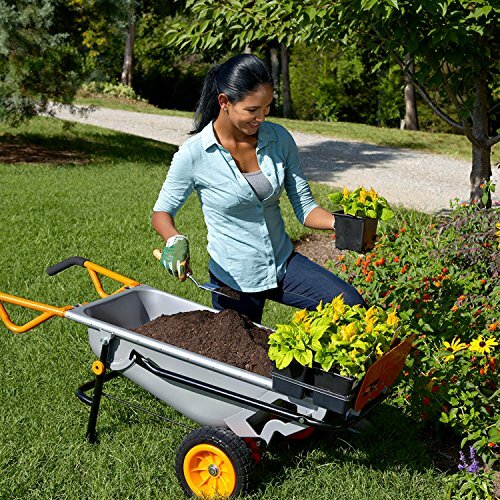 For gardeners who want the benefits of both a wheelbarrow and a garden cart, this Gorilla garden dump cart is an easy choice. If you want a multi-functional cart that can take you from the garden to the park, then you will love the Mac Sports foldable garden cart. This collapsible garden wagon has a strong steel frame, with a durable 600 Denier Polyester fabric bed that can hold up to 150 lbs of goods. The fabric is easy to clean and what’s even better is that once you have finished with it, it folds down compactly and with its own carry case it is so easy to store. Weighing only 22.6 pounds this is a lightweight garden cart which makes it super easy to maneuver. This cart is light and compact in fact, that you can put this folding lawn cart in the back of your car and use it to haul the family’s items, whether that’s for a picnic in the park or a day at the beach. It even has two mesh cup holders for your drinks! If storage is an issue and being multi-functional is important to you, the Mac Sports collapsible cart is the perfect choice for you. If you like the design of a traditional wheelbarrow wagon design but prefer the sturdiness of a 4 wheel yard cart, then consider the Worx Aerocart 2 wheeled yard cart. This 2 wheel yard cart is super versatile and with its patented design which adjusts the center of gravity it super easy to lift and move even with a full load. The cart bed is constructed from a heavy duty steel and has the capacity to hold 300 lbs. The fold out extension arm is what makes this wheelbarrow cart so versatile. Fold it out front and you can use this cart as a trolley to carry heavy items such as a refrigerator, moving boxes, or heavy pots. 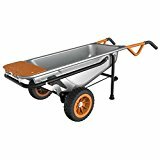 There are also additional accessories you can purchase to make this 2 wheel wheelbarrow even more convenient such as the Aerocart organizer, snow plow, or wagon kit. The Worx Aerocart cart is a handy tool to have in anyone’s home and is the perfect helping hand in the garden. If you have a small garden but could still do with a cart to maneuver various garden tools, the Suncast Poly Lawn Cart is a great option. 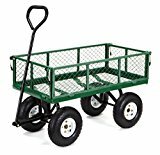 At only 11 pounds this is a super lightweight lawn wagon and the cart bed is fairly deep with the ability to carry 15.5 gallons, making it perfect for grass clippings, leaves, soil or garden tools. This garden bucket on wheels includes a telescopic handle, so it can collapse making it easier to store in a small space. This small garden wagon would make the perfect accessory for the small garden owner.